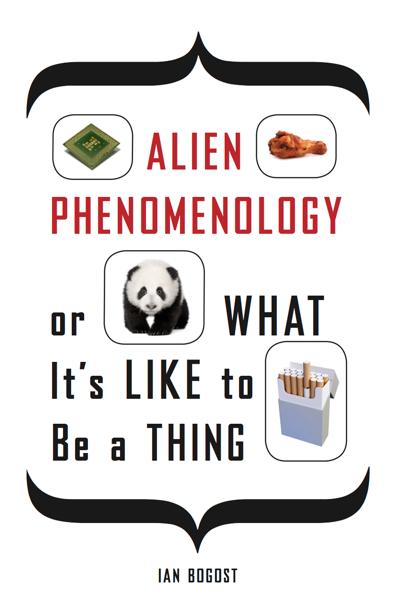 Here’s the cover design, tagline, and blurb for my forthcoming book Alien Phenomenology, or What It’s Like to Be a Thing, which will be published by University of Minnesota Press in early 2012. It’s hard to express how exciting it is to have a hot wing on the cover of one of my books. And a cute panda. Other objects will appear on the back, including a green chile and a stiletto, at least. A bold new metaphysics that explores how all things–from atoms to green chiles, cotton to computers–interact with, perceive, and experience one another. In Alien Phenomenology, or What It’s Like to Be a Thing, Ian Bogost develops an object-oriented ontology that puts things at the center of being; a philosophy in which nothing exists any more or less than anything else; in which humans are elements, but not the sole or even primary elements, of philosophical interest. And unlike experimental phenomenology or the philosophy of technology, Bogost’s alien phenomenology takes for granted that all beings interact with, perceive, and experience one another. This experience, however, withdraws from human comprehension and only becomes accessible through a speculative philosophy based on metaphor. Providing a new approach for understanding the experience of things as things. Bogost also calls on philosophers to rethink their craft. Drawing on his own experiences as a videogame designer, Bogost encourages professional thinkers to become makers as well, engineers who construct things as much as they think and write about them. Wow, this is interesting, the other day i was discussing with a friend about the consciousness being awareness, that we are nothing but objects with a broadband I/O port, and ultimately that can be defined as “life” in the most essential way of meaning. The idea is, everything in some level has interactivity with external stuff, so, everything is “alive” in some degree and some systems just have more feedback than others. Maybe this is just basic OOO but i was starting to dive into this from a lonely thinker (and a game designer too) POV. My ignorant self didn’t know the concept was being fleshed out at this level. Hi Brian, OOO is primarily concerned with two things: first, a rejection of what Quentin Meillassoux calls “correlationism,” the assumption that all philosophy involves the interplay (or correlation) of human and world; and second a focus on individual entities as the fundamental material of being. There are other details, but those are the key bits. Within that framework, there’s certainly room for a vitalist or panpsychic position, which is what you’re getting at in your comment. My position is more panexperientialist, because I think that helps us remember that “alive” is really a human metaphor. Congrats! I can’t wait to read this! Looking forward to your book. The transhumanism crowd has grazed similar topics but you tend to organize your thoughts and write clearly. Unquestioning acceptance of human exceptionalism as a given has led to a debilitating philosophical blind spot. Here’s hoping your phenomenology provides tools to break down some of the artificial boxes and words we draw around things for convenience. With a bit of elucidation it becomes clear how complex and intertwined “object interaction” is. “Alive”, “dead”, “meaningful”, and “self” are concepts that have been so hard for the vast majority of people to think clearly about. I hope you’ve discovered why and expressed it.